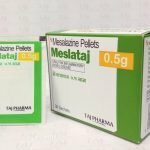 Individual dosage, up to 4 g mesalazine once daily or divided into 2-4 doses. Individual dosage. 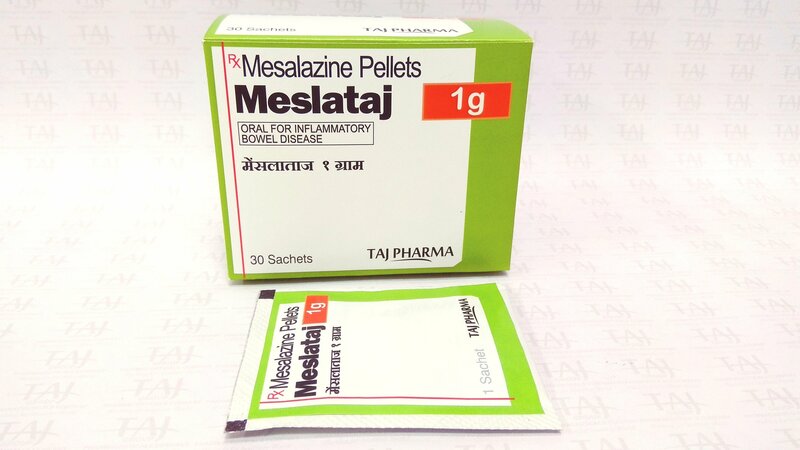 Recommended dosage, 2 g mesalazine once daily. Active disease: To be determined individually, starting with 30-50 mg/kg/day in divided doses. Maximum dose: 75 mg/kg/day in divided doses. The total dose should not exceed 4 g/day (maximum adult dose). Maintenance treatment: To be determined individually, starting with 15-30 mg/kg/day in divided doses. The total dose should not exceed 2 g/day (recommended adult dose). It is generally recommended that half the adult dose may be given to children up to a body weight of 40 kg; and the normal adult dose to those above 40 kg. The granules must not be chewed. The contents of the sachet should be emptied onto the tongue and washed down with some water or orange juice. Hypersensitivity to mesalazine, any of the excipients, or salicylates. Severe liver and/or renal impairment. Caution is recommended when treating patients allergic to sulphasalazine (risk of allergy to salicylates). In case of acute symptoms of intolerance, i.e. abdominal cramps, abdominal pain, fever, severe headache and rash, the treatment should be discontinued immediately. Caution is recommended in patients with impaired liver function. Liver function parameters like ALT or AST should be assessed prior to and during treatment, at the discretion of the treating physician. The drug is not recommended for use in patients with impaired renal function and in patients with haemorrhagic diathesis. The renal function should be regularly monitored (e.g. serum creatinine), especially during the initial phase of treatment. Urinary status (dip sticks) should be determined prior to and during treatment at the discretion of the treating physician. Mesalazine induced nephrotoxicity should be suspected in patients developing renal dysfunction during treatment. The concurrent use of other known nephrotoxic agents, such as NSAIDs and azathioprine, may increase the risk of renal reactions. Caution is recommended in patients with active peptic ulcer. Patients with pulmonary disease, in particular asthma, should be very carefully monitored during a course of treatment. Mesalazine-induced cardiac hypersensitivity reactions (myo- and pericarditis) have been reported rarely. Serious blood dyscrasias have been reported very rarely with mesalazine (see section 4.5). Blood tests for differential blood counts is recommended prior to and during treatment, at the discretion of the treating physician. Treatment should be discontinued on suspicion or evidence of these adverse reactions. As a guideline, follow-up tests are recommended 14 days after commencement of treatment, then a further two to three tests at intervals of 4 weeks. If the findings are normal, follow-up tests should be carried out every three months. If additional symptoms occur, these tests should be performed immediately. No interaction studies have been performed. Combination therapy with MESLATAJ and azathioprine or 6-mercaptopurine or thioguanine have shown a higher frequency of myelosuppressive effects, and an interaction cannot be ruled out, however, the mechanism behind the interaction is not established. Regular monitoring of white blood cells is recommended and the dosage regimen of thiopurine should be adjusted accordingly. There is weak evidence that mesalazine might decrease the anticoagulant effect of warfarin. 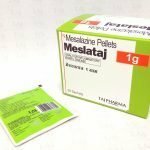 MESLATAJ Sachet should not be used during pregnancy and lactation except when the potential benefits of the treatment outweigh the possible hazards in the opinion of the physician. The underlying condition itself (Inflammatory bowel disease (IBD)) may increase risks for adverse pregnancy outcome. 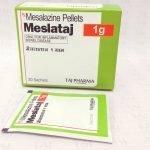 Pregnancy: Mesalazine is known to cross the placental barrier and its concentration in umbilical cord plasma is lower than the concentration in maternal plasma. The metabolite acetyl-mesalazine is found at similar concentrations in umbilical cord and maternal plasma. 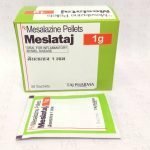 Animal studies on oral mesalazine do not indicate direct or indirect harmful effects with respect to pregnancy, embryo/foetal development, parturition or postnatal development. 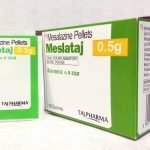 There are no adequate and well controlled studies of MESLATAJ use in pregnant women. Limited published human data on mesalazine show no increase in the overall rate of congenital malformations. Some data show an increased rate of preterm birth, stillbirth, and low birth weight; however, these adverse pregnancy outcomes are also associated with active inflammatory bowel disease. 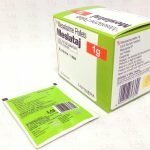 Blood disorders (leucopenia, thrombocytopenia, anaemia) have been reported in new-borns of mothers being treated with MESLATAJ Sachet. 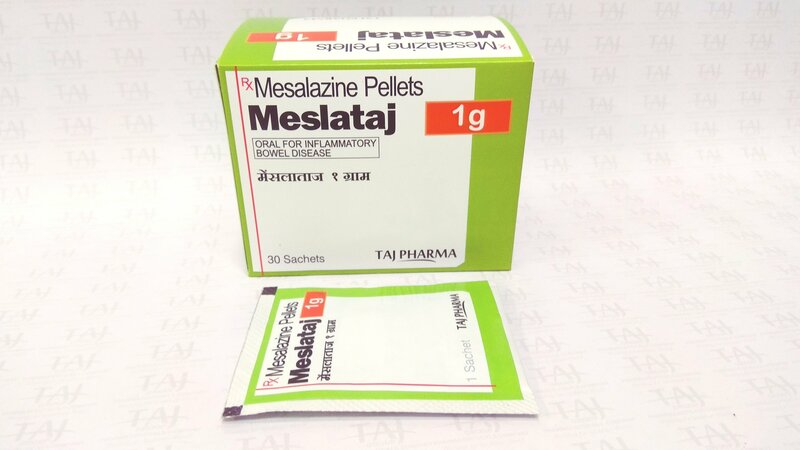 In one single case after long-term use of a high dose of mesalazine (2-4g, orally) during pregnancy, renal failure in a neonate was reported. 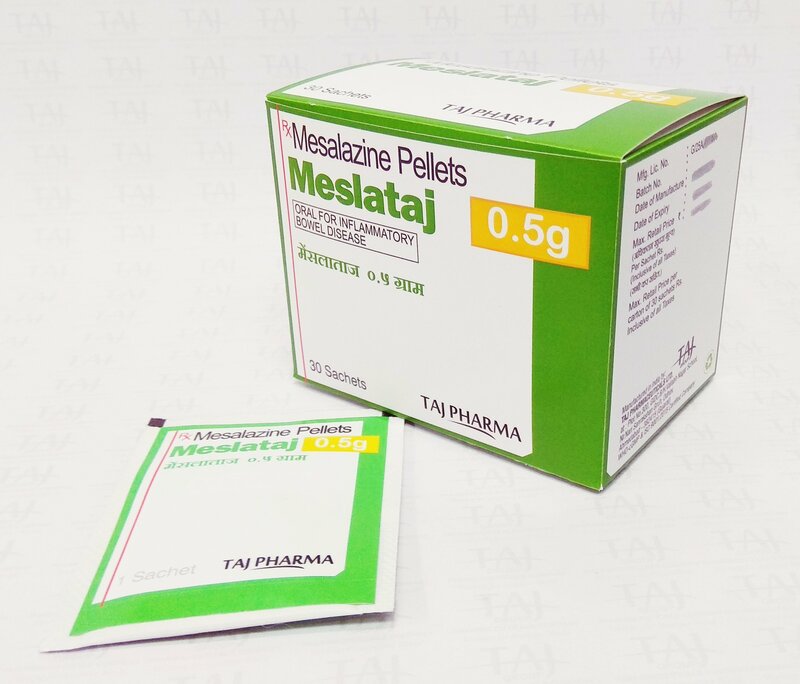 Breast-feeding: Mesalazine is excreted in breast milk. The mesalazine concentration in breast milk is lower than in maternal blood, whereas the metabolite – acetyl-mesalazine – appears in similar or increased concentrations. 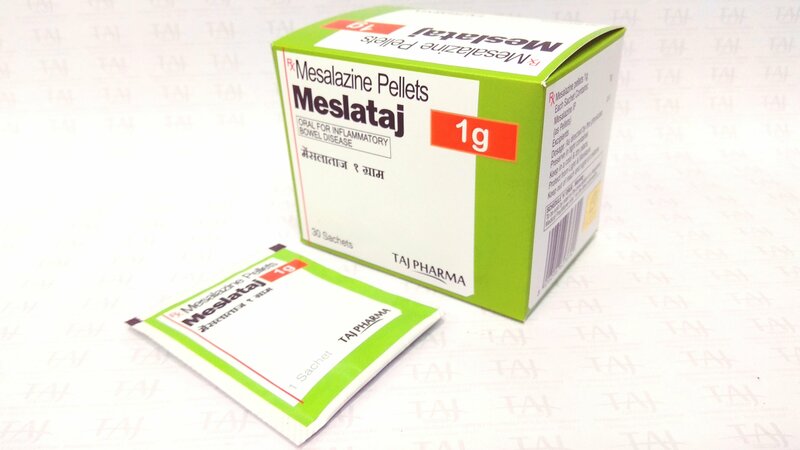 No controlled studies with MESLATAJ Sachet during breast-feeding have been carried out. Only limited experience during lactation in women after oral application is available to date. Hypersensitivity reactions like diarrhoea cannot be excluded. If the infant develops diarrhoea, breast-feeding should be discontinued. 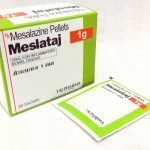 MESLATAJ Sachet has no or negligible influence on the ability to drive or use machines. The most frequent adverse reactions seen in clinical trials are diarrhoea, nausea, abdominal pain, headache, vomiting, and rash. Hypersensitivity reactions and drug fever may occasionally occur. Blood and the lymphatic system disorders Blood disorders such as: Anaemia, aplastic anaemia, agranulocytosis, neutropenia, leukopenia (incl. granulocytopenia), pancytopenia, thrombocytopenia, and eosinophilia (as part of an allergic reaction. 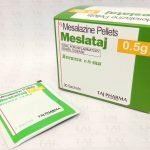 (*) The mechanism of mesalazine-induced myo- and pericarditis, pancreatitis, nephritis and hepatitis is unknown, but it might be of allergic origin. It is important to note that several of these disorders can also be attributed to the inflammatory bowel disease itself. Acute experience in animals: A single intravenous dose of mesalazine in rats of 920 mg/kg and single oral doses of mesalazine in pigs up to 5 g/kg were not lethal. 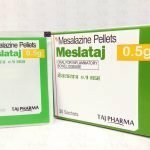 Human experience: There is limited clinical experience with overdose of MESLATAJ sachet which does not indicate renal or hepatic toxicity. 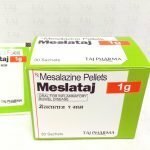 Since MESLATAJ is an amino salicylate, symptoms of salicylate toxicity may occur. Symptoms of salicylate over dosage are well described in the literature. There is no specific antidote and treatment is symptomatic and supportive. The treatment at hospital includes close monitoring of renal function. 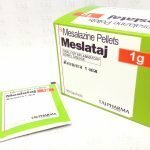 Mesalazine is the active component of sulfasalazine, which has been used for a long time in the treatment of ulcerative colitis and Crohn’s disease. The therapeutic value of mesalazine appears to be due to local effect on the inflamed intestinal tissue, rather than to systemic effect. There is information suggesting that severity of colonic inflammation in ulcerative colitis patients treated with mesalazine is inversely correlated with mucosal concentrations of mesalazine. Increased leukocyte migration, abnormal cytokine production, increased production of arachidonic acid metabolites, particularly leukotriene B4, and increased free radical formation in the inflamed intestinal tissue are all present in patients with inflammatory bowel disease. The mechanism of action of mesalazine is not fully understood although mechanisms such as activation of the γ-form of peroxisome proliferator-activated receptors (PPAR-γ) and inhibition of nuclear factor-kappa B (NF-κB) in the intestinal mucosa have been implicated. 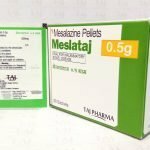 Mesalazine has in-vitro and in-vivo pharmacological effects that inhibit leukocyte chemotaxis, decrease cytokine and leukotriene production and scavenge for free radicals. 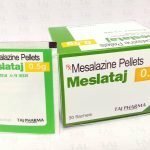 It is currently unknown which, if any, of these mechanisms play a predominant role in the clinical efficacy of mesalazine. The risk of colorectal cancer (CRC) is slightly increased in ulcerative colitis. Observed effects of mesalazine in experimental models and patient biopsies support the role of mesalazine in prevention of colitis-associated CRC, with down regulation of both inflammation dependent and non-inflammation dependent signalling pathways involved in the development of colitis-associated CRC. However data from meta-analyses, including both referral and non-referral populations, provide inconsistent clinical information regarding the benefit of mesalazine in the carcinogenesis risk associated with ulcerative colitis. 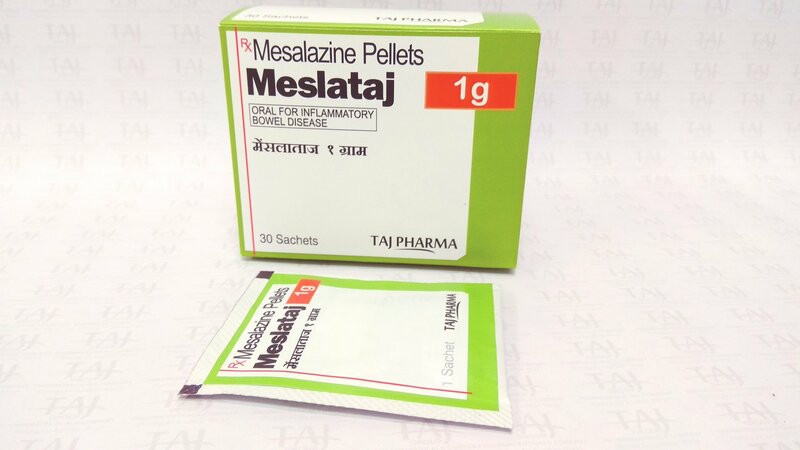 Disposition and local availability: The therapeutic activity of mesalazine most likely depends on a local contact of the drug with the diseased area of the intestinal mucosa. 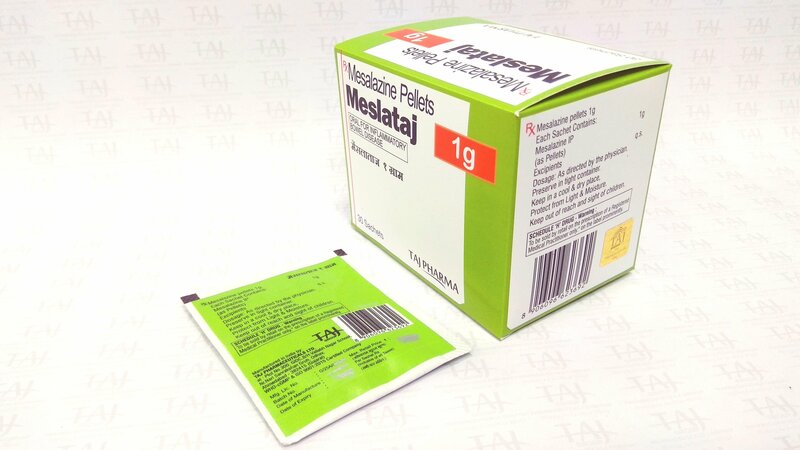 MESLATAJ Sachet prolonged release granules consist of ethylcellulose coated microgranules of mesalazine. The coated microgranules enter the duodenum within an hour of administration, independent of food co-administration. 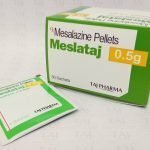 Mesalazine is continuously released from the coated microgranules throughout the gastrointestinal tract in any enteral pH conditions. Absorption: Bioavailability of MESLATAJ after oral administration can be estimated to approx. 30%, based on urine recovery data in healthy volunteers. Maximum plasma concentrations are seen 1-6 hours post-dose. A once-daily dosing regimen of mesalazine (1 × 4 g/d) and a twice-daily dosage (2 × 2 g/d) results in a comparable systemic exposure (AUC) over 24 hours and indicate a continuous release of mesalazine from the formulation over the treatment period. Steady-state is reached after a treatment period of 5 days following oral administration. Molecular weight of mesalazine: 153.13 g/moL; Ac-mesalazine: 195.17 g/moL. The transit and release of mesalazine after oral administration are independent of food co-administration, whereas the systemic exposure may be increased. 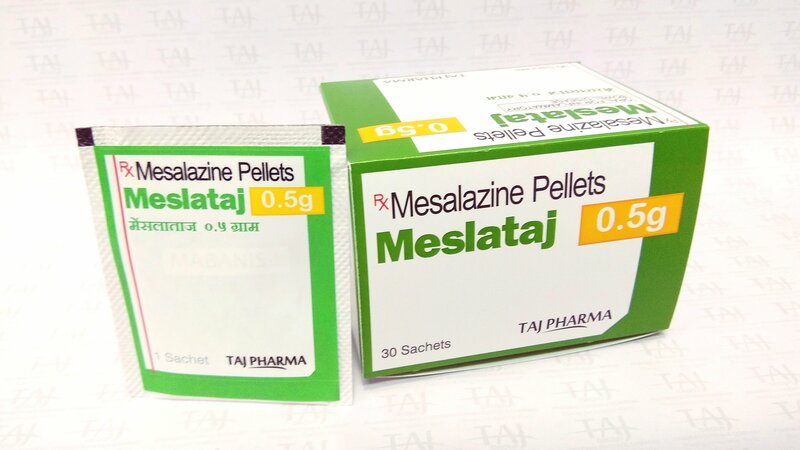 Distribution: Mesalazine and acetyl-mesalazine do not cross the blood-brain barrier. Protein binding of mesalazine is approximately 50% and of acetyl-mesalazine about 80%. 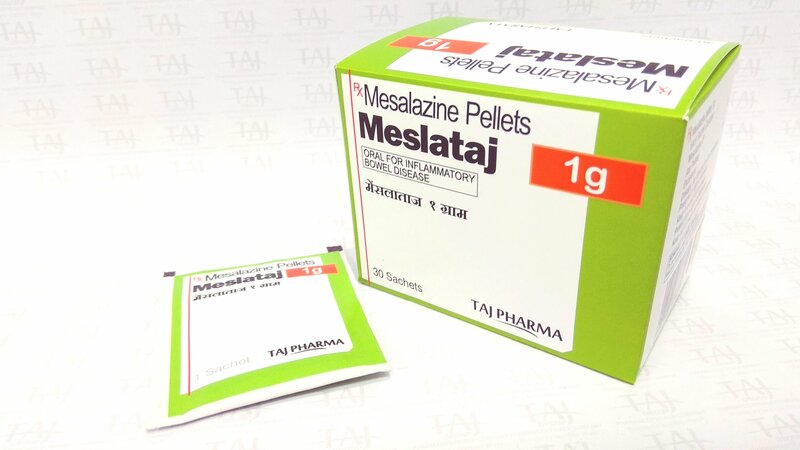 Metabolism: Mesalazine is metabolised both pre-systemically by the intestinal mucosa and systemically in the liver to N-acetyl-mesalazine (acetyl-mesalazine) principally by NAT-1. Some acetylation also occurs through the action of colonic bacteria. The acetylation seems to be independent of the acetylator phenotype of the patient. 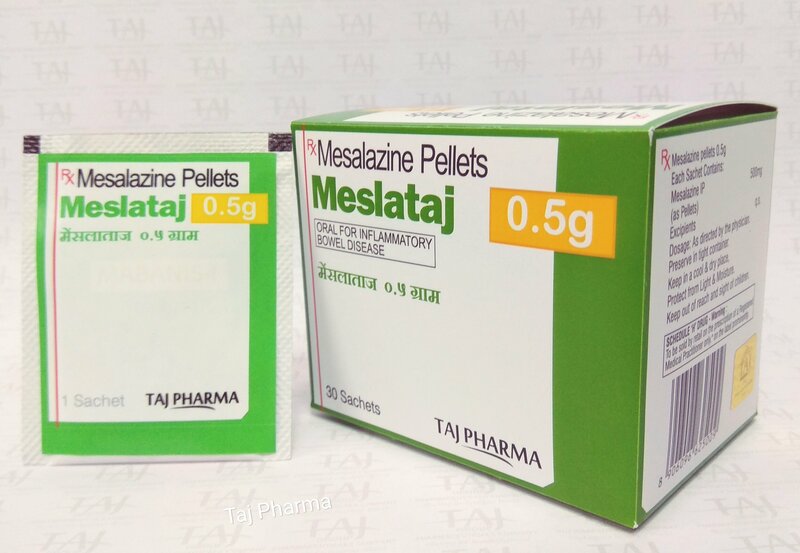 The metabolic ratio of acetyl-mesalazine to mesalazine in plasma after oral administration ranges from 3.5 to 1.3 after daily doses of 500 mg×3 and 2 g×3, respectively, implying a dose-dependent acetylation which may be subject to saturation. 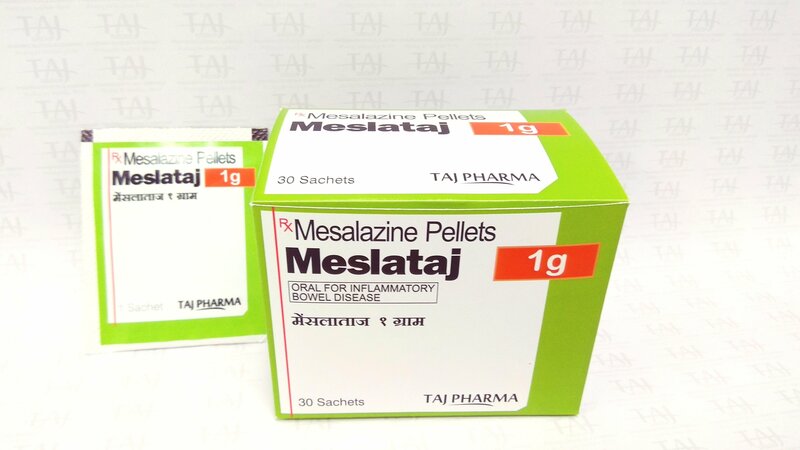 Elimination: Due to the continuous release of mesalazine throughout the gastrointestinal tract, the elimination half-life cannot be determined after oral administration. 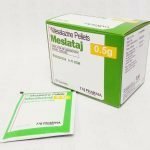 However, once the formulation is not present in the GI tract elimination will follow the plasma half-life of orally or IV administered uncoated mesalazine, which is approximately 40 minutes and for acetyl-mesalazine approximately 70 minutes. Pathophysiologic changes such as diarrhoea and increased bowel acidity observed during active inflammatory bowel disease have only a minor impact on the delivery of mesalazine to the intestinal mucosa after oral administration. A urine excretion 20-25% of the daily dose has been observed in patients with accelerated intestinal transit. Likewise, a corresponding increase in faecal excretion has been seen. Toxic renal effects have been demonstrated in all species tested. Rat and monkey dosages and plasma concentrations at the No Observed Adverse Effect Levels (NOAELs) exceed those used in humans by a factor of 2-7.2. In vitro test systems and in-vivo studies showed no evidence of mutagenic effects. Studies on the tumourigenic potential carried out in rats showed no evidence of any substance-related increase in the incidence of tumours. 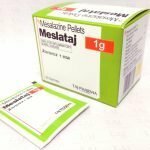 Animal studies on oral mesalazine do not indicate direct or indirect harmful effects with respect to fertility, pregnancy, embryo-foetal development, parturition or postnatal development. The granules should be used immediately after first opening of the sachet.